Chinese traditional art seldom contains characters in its paintings, though China is famous for its abundant population. On the 22nd December 2007, the Chinese media trembled with excitment at the news that the ancient ship Nanhai No.1 had been salvaged. Like many sunken wrecks, "Nanhai No.1" proved to be a treasure trove. 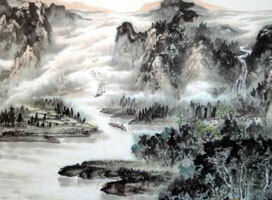 Chinese painting and calligraphy has a long history. Until the invention of paper in Han dynasty, artists began to paint on by brush pen, gradually, the real Chinese painting and calligraphy has been evolved. You may know the Silk Road, a trade route from west China to the continents of Europe and Africa since China´s Han Dynasty (206 B.C.-220) that got its name from the export of China´s silk. The Dazu stone carvings at Chongqing are one of ancient China´s most valuable treasures. They were declared a National Key Cultural Relics Protected Unit in 1961, and in 1999 they were listed as a World Culture Heritage Site.